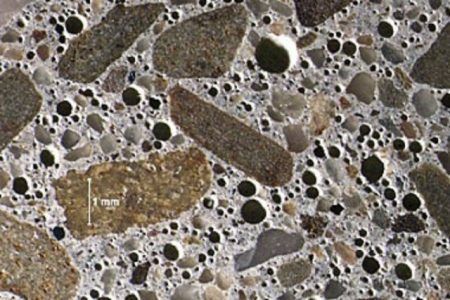 Air-entrained portland cement is a special cement which has air bubbles introduced in the cement or concrete that provides the space for expansion of minute droplets of waters in the concrete due to freezing and thawing and protects from cracks and damage of concrete. In this article we discuss about manufacture, air entraining agents, properties, advantages and disadvantages. The manufacture of this special concrete is same as that of normal ordinary portland cement, after the cement clinkers are formed, in the grinding process the cement clinkers are added with some air entraining materials which makes the cement as air entrained cement. Using gas forming materials as aluminium powder, zinc powder and hydrogen peroxide. Using surface active agents that reduces surface tension. They may be natural wood resins and their soaps, animal or vegetable fats or oils, alkali salts of sulfonated or sulphated organic compounds. Calcium ligno-sulphate and Calcium salts of glues. Fig 1: Process of expansion of water droplets in concrete. The workability property of this cement is high due to the air bubbles which act as lubricant between aggregates, which reduces water and sand requirement and hence increases strength of the concrete. It else reduce segregation and bleeding of plastic concrete. Abraham’s law is well know for a civil engineer. Strength and the W/C ratios are inversely proportional to each other. Less the W/C ratio, greater is the strength. With the use of air entrainer , the W/C ratio is kept low and hence the strength parameter of the concrete is not compromised. But it is difficult to attain high level strength concrete with air-entrained cement. In the cold environment, due to low temperature the water inside the concrete freezed and expands. Use of this cement provides required space for the water to expand and thus doesn’t let the concrete to rupture. However, entrained air bubbles serve as reservoirs for the expanded water, thereby relieving expansion pressure and preventing concrete damage. The resistance ability for sulphate attack is high in the air entrained cement as the W/c ratio can be kept low, which initiates the sulphate attack. The permeability of air entrained concrete is greater than that of non air-entrained concrete as the air bubbles break the capillary channels. Therefore, use air-entrained concrete where water tightness is a requirement. In the sloped structure, the ice is formed on the building. To remove these ice, de-icing chemicals used for snow and ice removal. The use of this chemicals forms a layer of scales in the concrete. Air entrained cement prevents scaling caused by de-icing chemicals and is recommended for all applications where the concrete contacts de-icing chemicals. Fig 2: Bubbles formation in concrete due to air entained cement. Use of air entraining agent reduces the effect of freezing and thawing. Bleeding, segregation and laitance in concrete reduces. Entrained air improves the sulphate resisting capacity of concrete. Reduces the possibility of shrinkage and crack formation in the concrete surface. The strength of concrete decreases. The use of air entraining agent increases the porosity of concrete thereby reducing the unit weight. Air-entrainment in concrete must not be done if the site control is not good. This is due to the fact that the air entrained in a concrete varies with the change in sand grading, errors in proportioning and workability of the mix and temperatures.